Noel Gallagher has "categorically" ruled out an Oasis reunion for Glastonbury 2016. The High Flying Birds frontman insists there is no way he will be reuniting with his younger brother Liam on stage for the world famous festival held in Somerset, South West England, in June next year and urged fans not to "go down the bookies" based on rumours. Talking to BBC Radio Two presenter Simon Mayo ahead of a live acoustic performance for the British station on Monday night (07.12.15), Noel said: "I can categorically state I won't be doing Glastonbury, so don't go down the bookies. 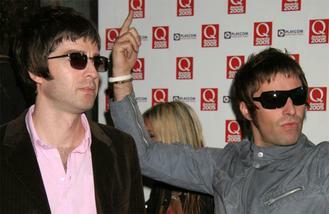 "Neither will, Beady Eye or any other off-shoot band that ever came from Oasis. I don't know what I'm doing but I'm not doing that. "I'm gonna go to Glastonbury though, but won't be playing." Following Oasis' split in August 2009, ex-Oasis guitarist Gem Archer joined Liam to form new group Beady Eye with fellow former Oasis members Andy Bell and Chris Sharrock. Oasis reforming were bolstered when Noel was joined on stage by Gem for an acoustic gig in front of just 200 people in Lincoln on Saturday night (05.12.15) and again in London on Monday evening. In June, the 'Wonderwall' hitmakers topped a fan poll to find the band they would most like to see headline Glastonbury. However, speaking about Gem joining him on stage for a series of acoustic gigs this month, Noel said it wouldn't be like "the old days." He said: "Gem is back playing guitar for the time being. Not like the old old days, kind of the latter of the old days." Meanwhile, tickets for Glastonbury sold out in just minutes when they went on sale in October this year. Rumoured headliners include Coldplay, Adele - who has been confirmed to have had talks - The Stone Roses, Rihanna and Muse. Pete Doherty was allegedly "decked" by Swervedriver singer Adam Franklin during an altercation in Hong Kong. Noel Gallagher has revealed how his dislike for Christmas has increased, after a cover of his track featured on the John Lewis festive advert. Kendrick Lamar leads the nominations for the Grammy awards after being named in 11 categories, including album of the year for To Pimp A Butterfly. Ed Sheeran is set to have surgery next month after he ruptured his eardrum while on vacation earlier this year. Pink Floyd, David Bowie and Mick Jagger stole The Osmonds' stage and video tricks and made them "cool". Sigma "never expected" to be invited to perform on 'The X Factor'. D.I.D have made "a miserable" Christmas song. Radiohead frontman Thom Yorke has potentially debuted two tracks from the band's upcoming album. Marina and the Diamonds’ final show of the year takes place in three acts, encompassing her three studio albums, in the grand surroundings of the London Palladium.